Google has discovered that certain spikes in search terms related to flu symptoms actually is a great indicator of flu activity. 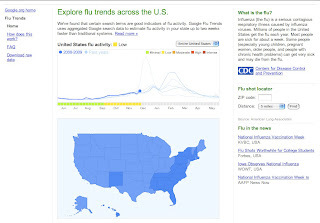 Google Flu Trends uses aggregated Google search data to estimate flu activity in your state up to 2 weeks faster than traditional systems including the CDC (Centers for Disease Control). Check it out!